As we get nearer to the off more people have been asking us how they can keep up to date with what we’re doing. Obviously the simplest way is to come here or subscribe to the RSS feed – or perhaps even subscribe to the videos – but as we’re out on the road we’ll be taking shed loads of photos – and that’s one of the best ways to see what we’re up to (‘see’ what I did there!?). You can see our photos as they’re uploaded right on flickr over at http://www.flickr.com/photos/journeytorussia/ – where you can comment on them and leave us little notes of encouragement – like this one. In order to do that you’ll need to sign up to flickr – and if you want our photos to appear on your flickr homepage then you’ll need to add us as a contact. The easiest way to keep up to date with the photos on the road is to simply add the RSS stream to your feed reader. 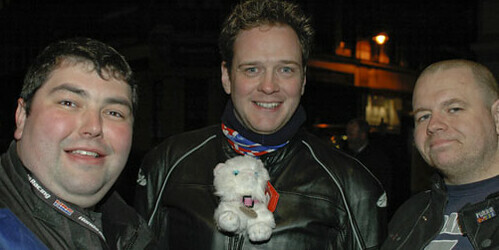 We promise to upload all photos and not censor any at all…. well maybe some… we don’t want people having nightmares…. Did you know that you can subscribe to our videos via iTunes? No? Well let me show you how. A little while ago we met a very nice chap called Michael Field at the Daily Telegraph Adventure Travel Show – we had a good talk to him and he told us the best way to keep ourselves dry on the road. After we got back Michael dropped us a line and very kindly offered to send us some bits and pieces to help us get our kit ready. I must be honest I’ve never really believed in after-market waterproofing – we’ve all been there and bought the sprays and the liquids and everything in-between from the camping shop – so when I put the jacket in the wash this weekend I wasn’t holding out much hope. So into the washing machine the jacket went, following the instructions on the tech wash bottle – 30 degree hand wash cycle – out it came dripping wet and not very much cleaner than before – but Michael had warned me – use the tech wash first otherwise the waterproof wont work. Given the beautiful weather this weekend it was dry in a couple of hours, so went back in on a 40 degree wash, gentle cycle, slow spin with the waterproof liquid. To cut a long story short, it took six hours in total to wash the jacket, dry it, wash it again and leave it dry once more. It’s not a task I’d do in anything but the best of weather. Allowing for British weather I didn’t have to wait long to test the application. This morning it was throwing it down, a perfect opportunity to see in action the wonder proofing that Michael had promised. I rode for an hour in the rain, constant but not heavy, fully expecting to have to change my top when I got into work. Arriving in west London I noticed something very odd, the water, as it was hitting my jacket was beading, gathering in little balls before running off all together. It’s not 100% efficient but most of the water simply wasn’t staying on the fabric. Getting into the office I pulled the jacket off to discover no wet spot – nothing at all – bone dry underneath. These two products form the basis of the Nikwax range, and frankly if everything else they produce works as well as these two, then it’s a name I’ll trust in the future. This video was originally shared on blip.tv by journeytorussia with a Creative Commons Attribution-NonCommercial license. There’s nothing better at the end of a hard day than a long cold beer, except perhaps a beautifully rich, deep bodied, glass of Bordeaux. Neither is that practical on a bike. The beer? Well it tends to be warm, and the wine? Frankly it doesn’t get out of France before I’ve finished off my three week supply. 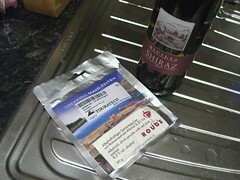 So to my absolute delight I discovered that you can freeze-dry wine – no seriously – you can buy 200ml of wonderfully rich ‘rouge’ wine direct from Touratech, and in a tiny little silver packet. Perfect. I was open minded about the wine, I’m not a snob and tend to drink bottles that are less than £5 a pop, but for £3.04 plus p&p even I was a little worried about the quality of the plonk delivered in a mere three weeks. 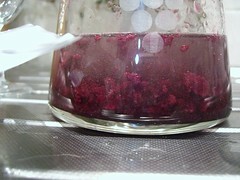 I prepared the equipment (a jug with 200ml of water, a long stirring thing, and a glass), opened the sachet and dropped in the rather lumpy, congealed powder – not confident at all it was going to dissolve. But to my surprise, the wine dissipated after only gentle encouragement. Five minutes dragged by and I was rewarded with a deep red jug of wine, ready for drinking at the fireside. What could be more perfect? The only thing remaining was to actually taste it. This is where the dream of wine on-the-go falls to pieces. Dear Lord… holy cow… and some other non-printable expletives. I’m struggling to describe it without having to resort to blawah, but I can’t come close. It tasted of chemicals, with a hint of toilet cleaner, and and after taste not dissimilar to Sunny Delight. This is a great idea, and I’m sure if somebody spends some time thinking how it actually tastes rather than trading on the idea of wonderful modern ease and travel, then it may succeed. Until then, drop into your local supermarket, buy the cheapest box of red – remove the outer packing – and be in rouge bliss. The Ady Smith school sounded like a really great way to spend the weekend. Not only was it going to be fun but I was also looking at it as further rider training and being able to relate some of things I learned on the weekend to my road riding. Ady Smith runs a good school that puts the safety of those on the course at the top of the list. So after being kitted up in full protective clothing and introduced to the latest 2008 KTM off roaders we had a safety briefing and I felt very at ease. The first part of the course was where we got used to the bikes on easy terrain. It was good to get the feel of how the bike behaved under power on slippery ground and in the corners. With not having fallen off I was feeling pretty upbeat and so on to a slower section where we learnt basic slow control and cornering. The format was pretty much the same for the rest of the weekend. We had sessions of instruction followed by practice then a bit of time putting it all together. As the course continued continued we tackled more complex skills. It all ended with a run around the enduro course where displayed the skills we learned from sliding the back end round bends, flat corners, riding through ruts and Jumps (yes jumps…) to name but a few. As we did this Ady and guys displayed a far higher level of skill and this added to the feel of the day. I can’t wait to try this again. I was looking forward to having a look at this book when it came out. 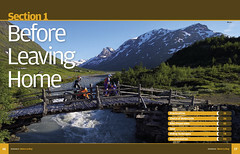 As practical ‘how to’ guides on adventure motorcycling are a bit few and far between so it’s nice to see another title for people to pick-up when they start planning or even dreaming about a long trip. On first impressions the book is nicely presented. It’s a full colour hardback that’s typical of many recent Haynes titles. The look and feel makes you want to pick it up and thumb through it looking at the stunning pictures that are included. I found myself settling down with a cup of tea almost straight away and looking forward to a quiet afternoon dreaming about a long trip on a bike. The book starts with a good introduction that highlights some of the pioneers of adventure motorcycling from the early days to more recent travelers like Grant Johnson and Ted Simon. Robert Wicks has divided his book into 3 parts, Before Leaving Home, On The Road and finally Typical Adventures. It’s nice and straight forward and each section contains a good level of detail on the sort of things you need to consider prior to the off and when you’re on the road. Each section contains small packets of useful information interspaced with inspiring photography from around the world. It’s a nice mix that’s easy to take in and isn’t heavy going at all and it’s all rounded off nicely with 3 ‘typical adventures’ which describe 3 different trips from a short two week jaunt to a mammoth 3 year adventure. There’s also a nice section that points you in the direction for finding further information. 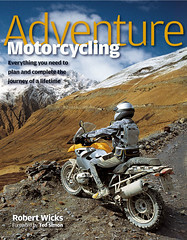 And this is the thing with the Haynes Adventure Motorcycling book. You can find quite a bit of information about planning a trip but without the depth you might need that you’d find in other titles on the subject. And this is the crux of the matter. Whilst it’s a great introduction for people starting out in the planning of a bike trip it’s not going to be enough for anyone looking for a bit more depth. When you look at the photo’s the other thing you notice is that it makes a lot of use of supported trips on the latest machines. 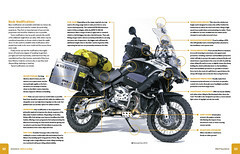 To me and many others the idea of doing a trip like this on the latest kit is a dream but the reality is that any bike will do and it would have been nice to see some of the more everyday types of bikes featured too rather than just the photo credits looking more like advert. So on whole a nice looking book that I found to be a great read and certainly made me wish for my departure date to be a lot closer than it is. As Ted Simon says in his forward if you read this book it will sharpen your appetite to discover the road ahead. Well as if a 5,000 mile trip to Russia wasn’t enough for me I’ve signed up for a special day out in June! 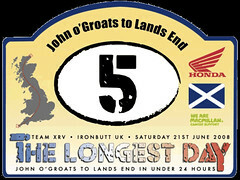 Myself and some friends from www.xrv.org.uk will be attempting to ride from John O’Groats to Lands End on 21st June 2008 – the longest day of the year. It’s approx 870 miles in total depending on the route. All in a day starting at about 4:30 am and finishing outside the Lands End Hotel – hopefully before midnight…. Why on earth would I want to subject myself, and in particular my rear end, to 850 miles plus in the saddle in one day? Well as I said it’s good practice for Russia but more importantly it’s to raise money for Macmillan Cancer Support. Macmillan work to support people with cancer and their families. They provide doctors, nurses and other specialists in hospitals and help families and loved ones cope with caring for someone with cancer. Our Russia trip is raising the profile of Everyman a group fighting male type cancers and this trip is helping a group dedicated to helping people cope with disease. When we started this whole thing we did wonder if we should do something ‘worthy’ to try and off-set the blatant fun we were going to have blasting around old Europe and Russia on our bikes. But when it came to choosing what to do the ‘charidee’ thing seemed a little… well, done and ‘old’. In fact we had quite a long discussion about if we should do it at all. It got quite cynical – would it help us get sponsorship? Would it help us get a foot in the door with people who could help us? Looking back now that seems absolutely dreadful, how could we possibly use a charity to further our aims of getting money out of large companies to pay for our summer holiday!? But those thoughts did cross our minds, in part I think because of the current explosion of Adventure Travel shows on the TV that do exactly that. But thankfully in the end we got talking to some fantastic people over at Everyman – part of the Institute of Cancer Research – apart from the fact male cancers get very little air-time in the media we felt really strongly that men don’t take enough notice of this kind of thing, it’s something very close to all three of our hearts – for various reasons – and if we can raise even a little cash through this site and this adventure, well, we’ve done something to help out. Today I’ve been humbled again by another £50 donation through our justgiving page – it always leaves me with my mouth open as I see people parting with their hard earned cash to help out a charity like Everyman. So to everyone that’s dug deep, to everyone who’s given what they can afford…. Thank you. Journey To Russia is powered by	WordPress 5.0.4 and delivered to you in 0.315 seconds using 32 queries.